The idea behind Grubwithus is an awesome yet simple one. 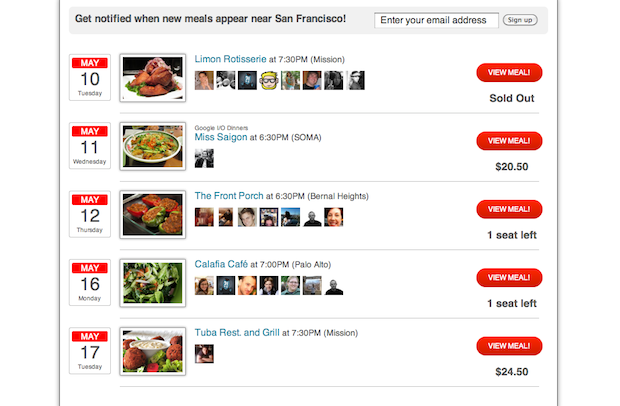 You browse for a restaurant you’d like to go to in a certain city and buy a ticket for your meal at a set price. But the key is that others do this as well, all with the intention of meeting new people over dinner. And when you’re buying your ticket, you can see who your dinner buddies will be. Yes, it’s sort of like Groupon meets Meetup. And yes, it’s brilliant. So it should be no surprise that a long list of prominent early-stage investors have decided they’d love to back Grubwithus. The service, which launched out of Y Combinator last year, has just raised a $1.6 million round. Who’s at the funding table? Andreessen Horowitz, First Round Capital, NEA, SV Angel, Ashton Kutcher, Guy Oseary, Vivi Nevo, Yuri Milner, Maynard Webb, Matt Cutts, Elad Gil, Paul Buchheit, Alexis Ohanian, Start Fund, and Y Combinator. Alongside the funding, the company is also highlighting two different types of dinners: charity dinners and raffle dinners. And the first two they’re doing are with investors Andreessen Horowitz and NEA. For the Andreessen Horowitz meal, which takes place a Tamarine in Palo Alto on May 18, you’ll have to bid to win a dinner with John O’Farrell and Scott Weiss (two of the general partners). The proceeds from the bidding will go towards Second Harvest Food Bank. The 10 highest bids will win seats at the table (and the bidding will close 24 hours before the event). The NEA meal is a raffle one. 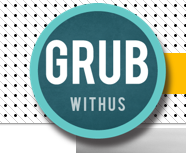 Essentially, anytime you book a meal on Grubwithus you’ll get a ticket. These tickets can then be used to enter to win access to the NEA meal — the more tickets you have, the better chance you have of winning the random draw. If you do win, you’ll be asked to pay the $35 set fee for the meal at Reposado in Palo Alto. Currently, Grubwithus operates in Chicago, San Francisco, New York, DC, and Los Angeles. Boston and Seattle will be opening very soon, co-founder Eddy Lu tells us. The biggest city remains Chicago, as that’s where the service first started, he says. The team is currently 8 people, but with the new funding they’ll be looking to hire quickly. And they’ll need to, as Lu realizes the competitors and clones will come quickly. One such competitor is LetsLunch, which launched in January. Lu also envisions expanding the idea of Grubwithus into other verticals and use cases. That makes sense given the obvious business model. Grubwithus has actually been making revenues since day one, Lu notes. They take a percentage from the restaurants they work with. “Restaurants love us because we want to create sustainable relationships with them and tell them to make sure they still make money using us,” he says. “Users also use Grubwithus for social utility, not financial utility, so it’s a bunch of high-quality users coming into these restaurants, not deal-hunting cheapskates,” he continues. You can probably guess which services he’s alluding to with those statements.